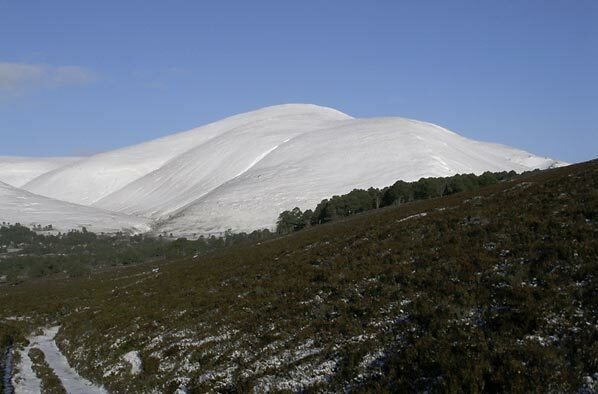 Beinn a' Bhuird has an elongated plateau orientated N to S with two tops of similar altitude 2.7km apart. 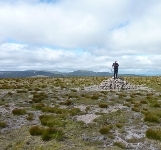 The N top is the summit. From Derry Cairngorm in the W the massive bulk of Beinn a' Bhuird dominates the skyline and its slopes appear moderate (in fact a vehicle track leads to the summit plateau). This view, however hides the true nature of Beinn a' Bhuird, as to the E of the summit plateau are the cliffs and crags of great corries. The South Top of Beinn a`Bhuird seen from the little used track higher up the east side of Glen Quoich with the first full coat of snow on 23rd November 2007. Beinn a' Bhuird from Morrone; 9th September 2009. The 'new' path from Glen Quoich laid by the NTS and the repaired bulldozed track - it will be some years until it's overgrown. 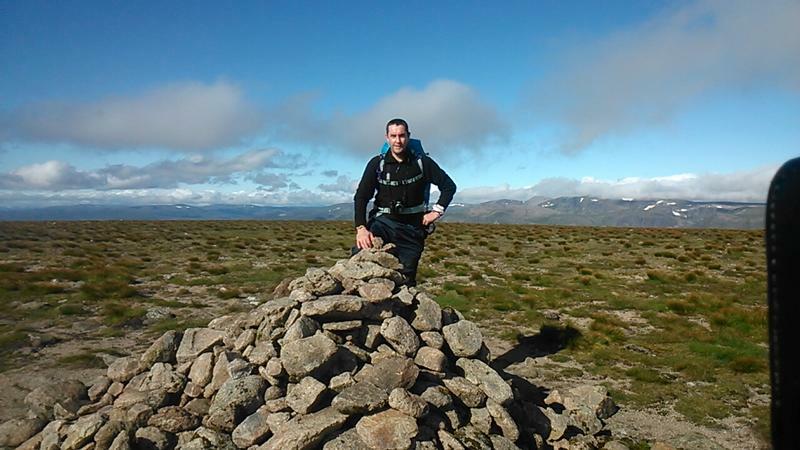 The summary information of one or more ascent routes that include Beinn a' Bhuird. 1 1460 m 34.67 km 9.5 hrs Beinn a' Bhuird A long route on moderately steep slopes leading to a high level plateau walk. There are deep corries to the east of the summit plateau, therefore, careful navigation required particularly in poor visibility. My self and fernie on number 212 :-) Aug 6th 2011. 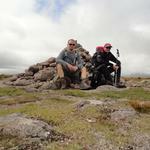 Post a few words about Beinn a' Bhuird or read what others have had to say. Climbed, like Ben Avon, via an excellent bus service from Aberdeen. The first service of the morning gets you to the Old Brig at 10am, then depending on how long you want to take, you can flag down a bus from Braemar from the same spot on the road (the private entrance to Invercauld is good) at 5, 6, 8 and 9 in the evening. And thats winter service as well, might be better in the summer. Invercauld estate now provided car park and toilets at Keiloch - costs £2 and proceeds spent on upkeep - evidence of work around Quoich water crossing - no bridge so prepare for wet feet - 1hr cycle from Keiloch to Slugain ruin on good track. 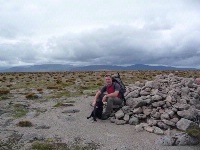 superb ground conditions for walking in this area - easy to add Ben Avon tor to this trip. Instead of leaving bikes at the Gleann an t-Slugain ruin, why not take them as far as gr113989. A well constructed path with drainage ditches will take you there with ease! The only rough section is past the ruin for 100m or so. 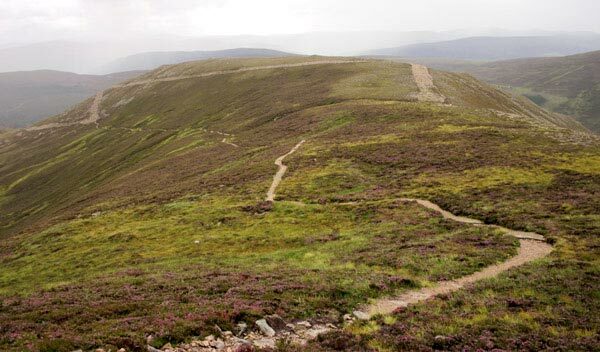 Bike up Glen Quoich from the Mar lodge until the path turns to single track. Leave the bike here and hike to the top. You can bag this in 6 hours or less.